On March 8, 1782, people once again proved how hate can lead to innocent lives began violently taken when Ninety-six Native Americans were massacred at Gnadenhutten, Ohio, the first European settlement in Ohio. The Native Americans killed were actually fellow settlers with the German Americans that founded the town, followers of the Moravian faith, White and Native people living together with a common religion for a common purpose. So why were the Delaware Indians (also called Leni Lenape) killed by the rampaging Pennsylvania militia that carried out the massacre? Because of raids committed against White settlements by Native Americans other than the Christian Delawares living with the other Moravians. Apparently, the old adage, “They all look the same” applied to the Pennsylvania militia that could not or would not differentiate between the many different Native American people, lumping all Native Americans into the same category, a typical form of human ethnocentric racism. The Leni Lenape (variously spelled Lenni Lenape, or just Lenape, or called Delaware) were originally from the Eastern area of what is now the United States, and were compelled to move Westward into the Ohio territory to avoid the encroaching of the European settlers in the New England area. This encroachment by Whites was aggravated by the displacement of other Native American tribes, such as the Iroquois, who also squeezed the Lenape people off their traditional lands. Into this Ohio area came Moravian missionaries with the aim of converting Native people to their faith. The Moravians, known formally as Unitas Fratrum, had its origins in the Bohemian/Moravian area of what is now the Czech Republic and Germany. The Moravian Church developed from the Protestant Reformation and is one of the oldest of the Protestant religions. Moravians fled to stay ahead of religious persecution, first to Saxony and on to the New World where they conducted missionary work in the Caribbean and the Mainland of North America. 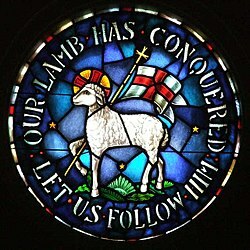 Church emblem featuring the Agnus Dei. Stained glass at the Rights Chapel of Trinity Moravian Church, Winston-Salem, North Carolina, United States. Photograph by JJackman. Gnadenhutten became a mission set up by Moravians in East Central Ohio in the hills near the Tuscarawas River in what is now Tuscarawas County, Ohio. It was the second such Moravian mission established on the frontier to convert Native people. The German American and Lenape settlers in Gnadenhutten were a peaceful people and had not taken an active role in the fighting of the American Revolutionary War. Gnadenhutten was founded about 1722, before the Revolutionary War and between the British dominated area to the North and West and the American dominated area of Pennsylvania. The Germans and Lenape wanted to live peacefully and avoid conflict between the competing European peoples along with their Native allied tribes. Alas, it was not to be. During the American Revolutionary War the British evicted the Lenape from Gnadenhutten in 1780-1781, including the imprisonment of the German pastor of the community and missionaries, causing starvation among the Lenape. The British suspected the Moravians, including the Lenape, of secretly assisting the Americans and giving the Americans military intelligence. About 150 Lenape were allowed to return to Gnadenhutten in 1782, in order to see to their farms and property, including harvesting crops and gathering food. Meanwhile, other Native Americans, including Lenape people not associated with the Moravians had sided with the British against the Americans, since the British had tried to limit the Westward expansion of White settlements in order to avoid conflict with Native people and Americans insisted on continuing the Westward movement of White/European settlements. Some of these angry Native people conducted raids against White American settlements in Pennsylvania, alarming and angering the Pennsylvanians. Location of Gnadenhutten, Ohio. Map by Catbar at English Wikipedia. A punitive expedition of the Pennsylvania militia, led by Lieutenant Colonel David Williamson, was mounted to punish Native raiders. When the Pennsylvania militia reached Gnadenhutten, they rounded up the Lenape and accused them of having committed the raids on American settlements in Pennsylvania. A decision was reached by the militia leaders to execute all the Lenape in their custody. Some of the militia men were appalled by this decision and left the expedition rather than participate in a cold blooded massacre. The remaining militia men apparently had no compunction about killing unarmed civilians and proceeded to massacre 96 of the peaceful Lenape people. Prior to the massacre, the captive Lenape were divided into 2 large buildings, one filled with Lenape men and the other containing the women and children. The Lenape were told of their impending doom, and spent the night prior to their murders singing hymns and praying. On the morning of March 8, 1782, the Pennsylvania militia executioners went about their awful business, first clubbing their victims on the head with large wooden mallets, and then scalping the immobilized Native Americans. Among the victims were 28 men, 29 women, and 39 children killed, with at least 2 boys surviving the scalping and later telling of the massacre. The bodies of the Lenape were piled up and burned, along with the entire village, but not before the Pennsylvania militia ransacked and looted whatever possessions of value they could find. Other Moravian villages that had been abandoned or depopulated were likewise looted and burned. White American reaction to the massacre was mixed, with some people outraged by the mass murder of civilians and others satisfied that raids against White settlements had been avenged and further raids discouraged. Native Americans remembered the massacre as a reason to not trust Americans, and the issue probably contributed to fighting between Americans and Native Americans in the coming decades. Indian war leader Tecumseh said as much to William Henry Harrison, leader of the American force fighting the Native Americans at the time and a future President of the United States, in 1810. President Theodore “Teddy” Roosevelt later called the massacre “a stain on the frontier character that time cannot wash away.” Moravian missionaries later gathered the remains of the victims at Gnadenhutten and buried them in a large mound outside the village. The State of Ohio later erected replica buildings of the village and the site of the massacre is listed in the National Register of Historic Places. Questions for Students (and others): Do you know how to pronounce “Gnadenhutten?” What other famous massacres of Native Americans by Whites can you think of? The Burial mound at the Gnadenhutten Massacre Site. Photograph by Bwsmith84 at English Wikipedia. Elder, Thomas. The Gnadenhutten massacre and death of Crawford. Thomas L. Elder, 1906. Seguin, Marilyn. Bell Keeper: The Story of Sophia and the Massacre of the Indians at Gnadenhutten, Ohio, in 1782. Branden Books, 2014. Williston, George. Desperation On The Western PA Frontier 1781-1782. Closson Press, 2007. The featured image in this article, a photograph by Bwsmith84 at English Wikipedia of the mass grave of the Indian martyrs at the Gnadenhutten Massacre Site, is licensed under the Creative Commons Attribution 3.0 Unported license.